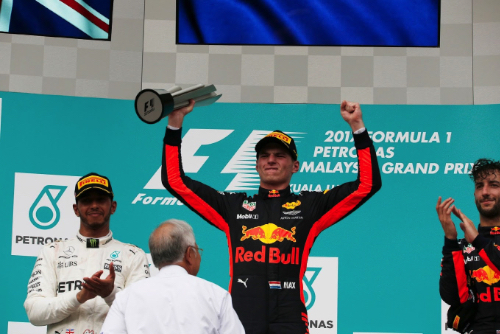 Max Verstappen in the Red Bull took the lead from polesitter Lewis Hamilton on the fourth lap and never looked back to win the Malaysian Grand Prix. Hamilton finished in second place in his Mercedes, 12.7 seconds behind and Daniel Ricciardo finished third in the second Red Bull, 22.5 seconds behind the winner. The win is Verstappen's second career win, just a day after turning 20-years-old yesterday, and Red Bull's second win of the season. Hamilton extends his lead in the Drivers Championship to 34 points. Sebastian Vettel (37.362s) drove a storming race from 20th on the grid to finish in the Ferrari in fourth, followed by Valtteri Bottas (56.021s) in the second Mercedes was fifth, Sergio Perez (1m17.630s) in the Force India-Mercedes was sixth, Stoffel Vandoorne (1 lap) in the McLaren-Honda was seventh, Lance Stroll in the Williams-Mercedes was eighth, his team mate Felipe Massa was ninth and Esteban Ocon in the second Force India finished in the final points scoring position in tenth. A little earlier before the pitlane opened a rain storm came through - drivers going to the grid with intermediate wet tyres, with the track drying before the start. Hamilton starts on pole for Mercedes with Raikkonen alongside in his Ferrari, the two Red Bull's of Verstappen and Ricciardo on row two, Bottas and Ocon on row three, Vandoorne and Hulkeberg on row four, Perez and Alonso rounding out the top ten. Vettel, after not getting a lap in Q3 yesterday starts from the 20th position and will have to try to come through the field. 20 minutes before the start Raikkonen reports problems with the power of his Ferrari, and the team swarms the car, working on the rear of the car before the start. There is a 30% chance of rain for the race with no rain expected in the first 30 minutes of the race, the track having dried out enough for all the drivers to start on dry tyres, with all starting on super soft tyres, except at the back of the field Wehrlein, Ericsson and Vettel starting on soft tyres. Six minutes before the start, Ferrari decide to push Raikkonen off the grid to the pitlane to continue trying to fix his car before the start. At the appointed time the grid clears and the drivers take the formation lap. The lights go out and the race starts with Hamilton taking the lead, Bottas making a quick start and goes side-by-side with Verstappen in the first corner, but Verstappen comes back and takes second, Bottas third, followed by Ricciardo, Vandoorne, Perez, Ocon, Stroll, Massa and Magnussen in tenth. Raikkonen never starts and is out of his car. Vettel is up to 13th on lap 1, and then passes Hulkenberg for 12th. On lap 4 Verstappen passes Hamilton into the first corner for the lead of the race. Hamilton is on Verstappen's tail trying to keep pressure on Verstappen. Vettel is up to 11th behind Alonso's McLaren. On lap 5 Verstappen sets fast lap at 1m36.867s. Ocon reports some front wing damage from coming together with his team mate Perez. On lap 7 Verstappen puts in another fast lap at 1m36.863s. Hulkenberg in 12th reports "there is a funny feeling on the front axle at high speed." On lap 7 Perez passes Vandoorne for fifth place. On lap 9 Ricciardo and Bottas battle back and forth, Ricciardo taking over third place. Vettel passes Alonso for tenth, and then passes Magnussen for ninth place. On lap 10 Hulkenberg pits and switches to soft tyres. At lap 10 Verstappen leads Hamilton by 4.3 seconds, followed by Ricciardo (11.5s), Bottas (16.2s), Perez (19.6s), Vandoorne (23.4s), Stroll (25.9s), Massa (27.7s), Vettel (28.7s), Alonso (32.3s) and Palmer (33.7s) in tenth. Hulkenberg pits again. Magnussen and Massa also pit. On lap 12 Verstappen sets fast lap at 1m36.2 seconds, Hamilton is lapping half a second slower and is now 6.0 seconds behind. On lap 13 Stroll pits for soft tyres. Vandoorne and Palmer, and Ocon pit as well. Stroll passes Massa for 12th. Ricciardo reports understeer coming on through his tyre run. The team reports that they will try putting on more front wing at the stop. On lap 19 Vetel is closing on Perez in fifth place and uder DRS passes the Mexican driver into the first corner. At lap 20 Verstappen leads Hamilton by 8.9 seconds, followed by Ricciardo (13.5s), Bottas (27.9s), Vettel (32.2s), Perez (33.6s), Alonso (52.0s), Sainz (54.1s), Ocon (55.7s) and Vandoorne (66.7s) in tenth place. Verstappen reports that his left front tyre is wearing. Vettel closes on Bottas in fourth, Ocon closes on Sainz in eighth. Hamilton reports his tyres are starting to drop off. On lap 25 Ocon trys to make a pass of Sainz on the outside of turn 1, the two touch and Ocon spins, but continues, losing several places. On lap 27 Hamilton pits for soft tyres and comes out just ahead of the Bottas, Vettel battle. Alonso pits from seventh switching to soft tyres, rejoining in 15th. On lap 28 Verstappen pits from the lead switching to soft tyres, rejoining behind Ricciardo who takes over the lead. Vettel pits as well, switching to super soft tyres, rejoinng in sixth. Red Bull tells Ricciardo, "we are going to extend." On lap 28 Hamilton sets fast lap at 1m34.723 seconds. The next lap Ricciardo pits from the lead for soft tyres and rejoins in third. On lap 29 Vettel sets fast lap at 1m34.500s. Sainz pulls into the pits from eighth position to retire with an engine problem. Ocon battles Massa for ninth. Alonso battles and passes Magnussen for 13th. Alonso reports to McLaren, "what an idiot, Hulkenberg is right!" At lap 32 Verstappen leads Hamilton by 7.9 seconds, followed b Ricciardo (18.3s), Vettel (30.9s), Bottas (39.8s), Perez (51.7s), Vandoorne (69.7s), Stroll (72.1s), Massa (74.6s) and Ocon (75.4s) in tenth place. On lap 34 Vettel sets fast lap at 1m34.371 seconds, and then again the next lap at 1m34.342s. Ricciardo reportably has a problem with damage to his floor, but it doesn't appear to be holding the Australian back. On lap 38, Palmer half-spins but continues just ahead of the leader. Palmer continues to have problems and spins alongside Magnussen. On lap 39 Vettel sets another fast lap at 1m34.218s. Magnussen reports "I have damage on the car, I don;t know how long it will last." At lap40 Verstappen leads Hamilton by 9.0 seconds, followed by Ricciardo (16.0s), Vettel (22.0s), Bottas (39.6s), Perez (59.0s), Vandoorne (81.7s), Stroll (84.0s), Massa (87.0s) and Ocon (90.3s) in tenth. On lap 41 Vettel sets another fast lap at 1m34.080 seconds. On lap 45 Vettel closes to under a second behind Ricciardo in third place. On lap 49 Vettel is all-over the back of Ricciardo into the first corner. Ferrari tells Vettel, "attack now", Vettel responds, "let me do it". At lap 50 Verstappen leads Hamilton by 8.5 seconds, followed by Ricciardo (19.6s), Vettel (21.6s), Bottas (45.6s), Perez (71.1s), Vandoorne (1 lap), Stroll, Massa and Ocon in tenth place. Ricciardo has pulled a 3 second gap on Vettel. On lap 56, on the last lap Verstappen leads Hamilton, Ricciardo and Vettel to the finish. On the cool down lap, Vettel and Stroll collide, leaving the Ferrari driver stranded on the track. Vettel says, "is that possible? Stroll is not looking where he is going. He completely shunted into my car".